Taking advantage of a new green field setup, Kien Duc Plastic Packaging JSC (Innoplas) is equipped with the most advanced technologies of extrusion from Germany. Our customers benefit from the updated techologies with supreme quality films and unique packaging solutions. 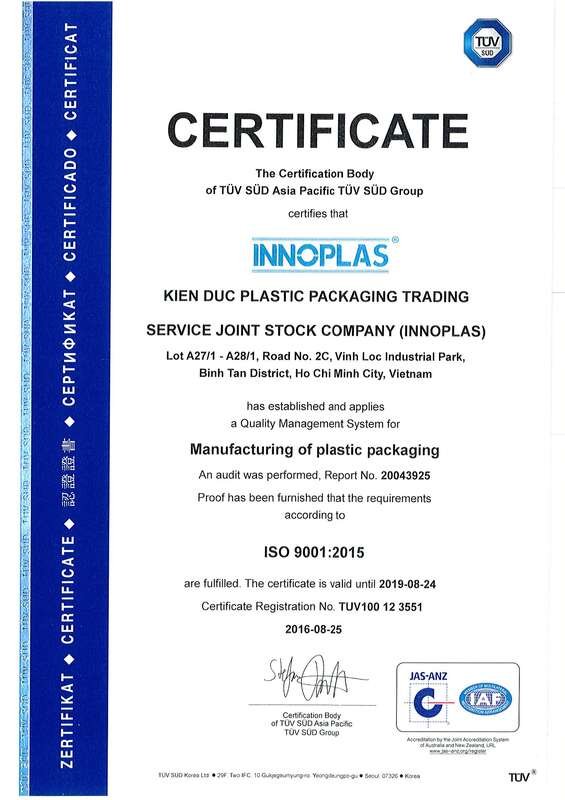 Kien Duc's film brand of Innoplas® is now recognised by converters as quality and innovative products. As the first and most important element of Our Core Values, we perform a continuos improvement of quality system to ensure our services and products meet the expertation. Customers shall benefit from us with products and additonally, the technical capability that we offer. Each and every individual of our team is a strong cell of Innoplas family, a solid organization. We help individual to grow and develop, to perform its best abilities and protentials, at the same time, enjoy the working environment that we create. We appreciate our people as the most valuable resource of Innoplas. Contribution, even the smallest, is recognised and respected. We operate with dignity and pride. We respect our external partners such as customers, suppliers, services providers, etc., and expect the compliance to our code of conducts and local regulation. Quality System helps us to manage the process to achieve our commitment of high quality products and services to customers. We are continuously improving our quality system for better compliances for hygien and food safety manufacturing. as per Global Food Sustainable report. helping the Food chains with longer reservation period of time. EVA copolymer with VA content range 5-20% is common on market, they are mainly recognized for their Flexbility, Transparency, Toughness, and Sealablity. High Clarity, Flexibility and impact strength at Low temperature. Excellent Heat seal Strength, Hot-tack and Low SIT (Sealing Initial Temperature). Sealant layer for food applications: Cheese, Meat, and Poultry, etc. Good at Heat seal Strength, Hot-tack and seal throught contamination. With density 0.93-0.965 g/cm3, MDPE/HDPE provides a good stiffness, machenical strength and moisture barrier (WVTR) in multilayer structure. Good at water barrier and chemical resistance. Water barrier chemical resistance layer in multilayer of liquid product content. PP is the most common plastic with low density at 0.9 g/cm3 and a wide application with sealability, stiffness, moisture barrier and heat resisatant. Tie is Coextrusion Adhesive resin, it is modified with function graft to joint two un-compatible polymer. Able to joint two un-comatible polymer layers. Tie resin can be processed on Blown film line. Symetric and Asymetric barrier structrue of multilayer process. EVOH is an excellent Oxygen barrier polymer. Their Oxygenl Barrier will be impovied by increasing Hydoxyl (OH) conntent in polymer. PA provides a wide excellent properties like Heat resistance, Puncture resistance, Transparency, Thermoformability and effecive barier like gas, chemical and Aroma. High impact and puncture resitance applications. Acknowledged the importance of right people who build up company’s success, we fully concentrate to develop our people in both working skills and their own internal potentials. We provide our people the best place to work at. If you are challenge-taken person, and refer the dynamic environment, feel free to submit your personal details below.